The newest niche to be conquered by BMW is filled by the 2 Series Active and Gran Tourers. These front-wheel drive hatchbacks mark a couple of firsts for BMW, namely the front-wheel drive and transverse engine mounting. These two cars aren’t going over very well with enthusiasts, but are doing great in sales in Europe. 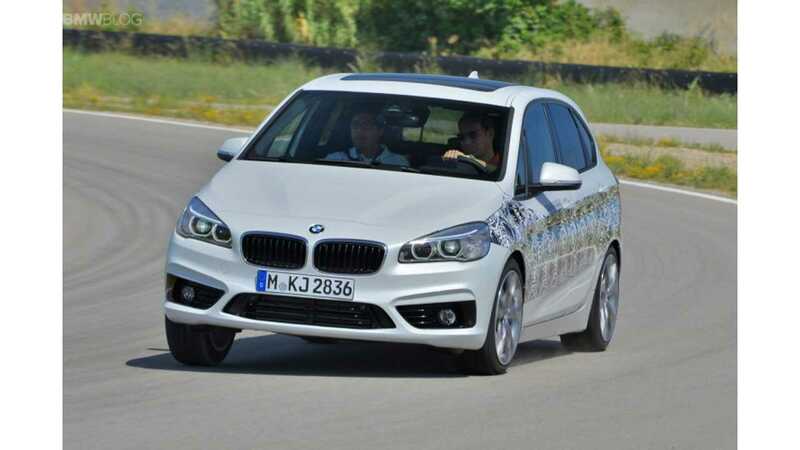 Well, BMW has decided that the new 2 Series Active Tourer is doing well enough that it wants to give it a new model. An eDrive plug-in hybrid model. The 2 Series Active Tourer eDrive will feature BMW’s 1.5 liter three-cylinder TwinPower engine, transversely mounted powering the front wheels through a six-speed automatic, and an 88hp / 136 Nm/100 lb-ft of torque electric motor, powering the rear wheels through a two-speed transmission. This essentially makes the 2 Series Active Tourer eDrive a backwards i8, as the i8 uses a similar setup, but with the engine at the rear and motor at the front. Compared to a 225i xDrive model, this adds some 150 kg or 330 pounds. The gasoline engine produces 100 kW/136 hp and 220 Nm/162 pound-feet of torque/electric. Like the i8, the 2 Series AT eDrive will deliver its power instantaneously, thanks to the torque fill effect of the electric motors adding power while the turbocharger gathers boost. This will shuttle the 2 Series AT eDrive from 0-62 mph in 6.5 seconds. Not bad for a front-wheel drive hybrid. Also, like the i8, the 2 Series AT eDrive will utilize both powertrains to give it an intelligent all-wheel drive system. It can send power to the front wheels, rear wheels or four wheels, depending as required. The system can also work with the Dynamic Stability Control to manage power for optimized traction, acceleration and efficiency. Speaking of efficiency, its EU cycle testing can see the 2 Series AT eDrive get an average of 2 liters per 100km (117 mpg US). That’s pretty amazing for a five seater wagon/hatchback with leather seats and the ability to hit 62mph in 6.5 seconds. The 2 Series AT eDrive will also feature BMW’s typical Driving Experience Control, which allows drivers to select from three different modes, Comfort, Sport and Eco Pro. All the modes do their usual thing, with Eco Pro mode precisely gauging power control over acceleration, air conditioning and even the heated seats, to eek out every last mpg. In addition to these modes, there is also an eDrive button that can be toyed around with. This eDrive button will select between three different modes of drivetrain management. During our quick drive in Miramas, France, we had the chance to experience all three driving modes on the BMW private race track. The ride kicked off in city driving mode (Auto eDrive) with the electric drivetrain picking up the first miles per hour before putting load on the engine and forcing the small three-cylinder engine to kick in. Auto eDrive mode, which is also the default mode, will use the electric motor and gas engine in tandem to combine for the greatest efficiency. It will start off in pure EV mode and only use the gas engine when necessary, such as at speeds above 80km/h (50mph). Next was the Max eDrive mode which uses just the electric motor to drive the vehicle and can do up to 130km/h( 81mph) and has a range of 38 kilometers (23 miles). The battery has a capacity of 7.7 kWh. Despite its fairly low power output, the little electric motor was potent enough to quickly take on the corners and put you back in your seat under full load. The range of the eDrive mode is 342 miles and the battery can be charged via a wall box in 2.15 hours and via socket in 3.15 hours. Finally, there’s Save Battery mode, which stores energy in the battery to be kept at a constant level. If the lever drops beneath its mark, it will use the engine to recharge the battery a bit. It can also store battery for a specific place in a predetermined journey, such as an urban area with congestion charges. Sport mode is the opposite of all of this, using the gasoline engine and electric motor in tandem to provide the maximum amount of power and performance. Drivers can also temporarily enter this mode by slotting the shifter into “S”, giving the driver the full power of both engines for passing maneuvers. Sport mode also helps to charge the battery when driving quickly, like in the i8, and can charge the battery up to 80 percent. So, if you’re running out of battery, pop it into Sport mode and drive fast, you’ll get it back in no time. The car feels dynamic and quick through the corners, and surprisingly even stable and with minimal body roll, thanks to the weight distribution and relatively low weight. The final test of the day included climbing a hill at about 45 degree angle. The goal here was to show the intelligent xDrive system and its capability to switch to the all-wheel drive setup when it senses an uphill road coming while approaching at low speeds. The xDrive switches automatically based on several factors – weight of the car, number of passengers, road conditions and angle. All of this functionality in a family style hatchback is very useful. BMW’s eDrive technology is able to transform the 2 Series Active Tourer into something much more. It’s both powerful and efficient and has excellent flexibility while also providing the kind of driving experience BMW owners are accustomed to. BMW’s eDrive will be appearing in many other cars in the coming months, but this is one of the more intriguing. The 2 Series Active Tourer eDrive will arrive in Europe in 2016.